There’s no doubt that healthy eating and regular exercise is the best combination to lose weight. 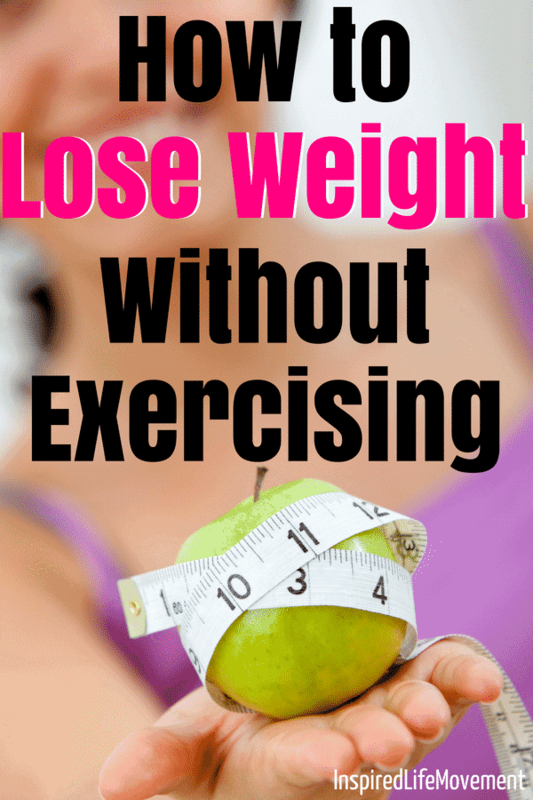 Having said that, there are many ways to lose weight without exercising. I’m not advocating skipping exercise altogether, and I’m certainly not going to give suggestions for unhealthy, dangerous ways to lose weight. I’m all about living a healthy, balanced life which doesn’t include things like weight loss pills or highly restrictive, unsustainable diets. So, with all that being said – if you’re completely anti-exercise right now, or if, for whatever reason, you’re unable to exercise and you want to lose weight, here are 10 healthy things you can do to help you lose weight without exercising. I’m sure you probably already know that soda is one of the most unhealthy things you can be drinking. Soda contains zero health benefits and is packed full of sugar and artificial ingredients. And diet soda isn’t any better – instead of refined white sugar, you’re getting a dose of artificial sweeteners, which are linked to cancer and other serious health problems. One can of soda contains an average of 150 calories with most of the calories coming from sugar and high-fructose corn syrup. According to ABC News, soda is the main source of calories in the average American’s diet, so cutting out soda can help lose weight, along with improving your overall health and lessening your chance of diseases like type-2 diabetes. Not only is water the healthiest drink, it’s also essential for cellular function and human life. If you find plain water difficult to drink, try one of these infusion water bottles to naturally flavor your water. The average dinner plate has grown in size substantially over the past few decades. And I’m not just talking about those platter-sized plates that restaurants use – I’m talking about your regular dinner plate at home. One of my favorite ways to lose weight without exercise and stop myself from overeating is to use a side plate as my dinner plate. This helps to avoid overloading your plate and will cut down on your calorie intake. Put your more calorie-dense foods on a side plate and then load up your large dinner plate with a healthy salad. Studies have shown that people who eat their meals too fast have a greater risk of obesity. Eating too fast doesn’t give your brain enough time to register whether you’re full or not, which causes you to overeat. Instead of chowing down on your food as fast as you can, slow down, chew your food thoroughly, and savor what you’re eating. If you’re prone to eating too fast, it might be helpful to count the amount of times you chew your food before swallowing. There are various recommendations for how long you should be chewing your food, but on average, you should be chewing soft foods 5-10 times before swallowing, and more dense foods like meat and harder vegetables up to 30 times. Not only will this help you slow down and reduce overeating, it will also help to improve nutrient absorption and digestion. You might think that skipping breakfast is a good way to save calories and give you a kickstart in your weight loss, but in fact, skipping breakfast will do just the opposite. Skipping breakfast causes your blood sugar levels to drop, which makes you feel lethargic and hungry. Additionally, your metabolism will be sluggish. This combination makes you highly likely to indulge in unhealthy snacks, which will contribute to weight gain. Instead of skipping breakfast, start your day with a healthy meal. Some ideas include oatmeal, a healthy smoothie, eggs or wholemeal toast with peanut butter and sliced banana. Sugar is one of the biggest culprits for weight gain, and unfortunately sugar is everywhere, even places you might not expect. Of course, you’ll get a sugar overload from the obvious culprits like soda, candy bars, ice-cream, donuts, cake, pastries, etc. But you might not realize that sugar is hidden in things like pasta, bread, salad dressing, yogurt, condiments like ketchup, crackers, lunch meat and many protein powders. Quitting sugar can be difficult – sugar addiction is real. Instead of immediately cutting out every single thing that contains sugar, I recommend starting slowly and cutting out the obvious culprits. Instead of reaching for a candy bar for your afternoon snack, switch it out for a handful of almonds or some carrot sticks and hummus. Switch out your soda for fruit-infused water, and instead of grabbing a frappe and a donut for breakfast, have a black coffee and oatmeal sweetened with fruit. A lack of quality sleep is associated with many health issues, suppresses your immune system, and can contribute to weight gain. When you’re sleep deprived, your body produces more cortisol, which is known as the stress hormone. An increase in cortisol levels causes your appetite to increase, which can lead to overeating. The amount of sleep you should be getting varies from person to person, but on average, an adult should be getting between 7-9 hours of sleep per night. If you have trouble falling asleep at night, one of the best natural sleep supplements is Valerian root. My husband suffered from insomnia for year. After taking a Valerian root supplement every night, he no longer suffers from insomnia and sleeps a full 8 hours every night. Staying properly hydrated is important for cell function, promotes cardiovascular health, keeps your skin supple and healthy, cleanses your kidneys and helps keep your digestive system moving. It’s very common to mistake thirst for hunger, which causes us to overeat and become even more dehydrated. The symptoms of dehydration are very similar to hunger, which often confuses us and causes us to think we’re hungry when in fact, we’re actually thirsty. Next time you’re feeling hungry, stop and think when was the last time you ate. Drink a glass of water, wait for 15 minutes and see if your hunger has subsided. If so, you were most likely dehydrated. Fruit is incredibly healthy and you should be eating 2-3 servings of fruit every day, but you can have too much of a good thing. Fruit contain a type of sugar known as fructose. While fructose is a lot healthier than refine white sugar and high fructose corn syrup, it contains the same amount of calories per serving. Consuming too many calories = weight gain, so it’s important not to overdo it with the fruit. You certainly shouldn’t be cutting fruit out of your diet. But make sure you stick to 2-3 servings of fresh or frozen fruit and avoid fruit juice, dried fruit and tinned fruit which lack in fiber and are higher in sugar content. If you fail to plan, you plan to fail. This goes for most things in life, including weight loss. How many times have you had a busy day at work, running errands or out with the kids and once dinnertime rolls around, you don’t have anything planned or you’re too tired to cook, so you end up ordering unhealthy takeout? If this sounds familiar, you’re not alone. The average American eats out 4-5 times per week. Not only is this costly, the average restaurant or takeout meal contains over 1200 calories, which is substantially higher than the calories that one meal should provide. To avoid resorting to takeout, it’s important to plan your meals in advance. Meal planning doesn’t have to be difficult or complicated, but if you’d rather have someone else handle meal planning for you, check out the 21-Day Weight Loss Transformation Guide that includes a 21-day meal plan. One of the easiest ways to lose weight without exercising is to avoid the temptation to eat healthy foods by not purchasing them. A 2016 study showed that people who kept unhealthy foods like candy, cereal, soft drinks and dried fruit on their kitchen counter were 9.4kg – 14.4kg’s heavier than people who didn’t have these types of foods visible. If you must have unhealthy foods in your house, keep them hidden in the pantry or kitchen cupboard – out of sight=out of mind. I know, I know. The title of this article is how to lose weight without exercising, and now I’m suggesting you do yoga. But I feel like I’d be remiss if I didn’t encourage you to do at least a bit of exercise. And if you’re completely aversive to exercise, then yoga might be the perfect, gentle way for you to get moving. Depending on the style of yoga you practice, you can burn up to 600 calories in one hour. There are many different styles of yoga, so if you’re new to yoga I recommend you read this article to help you find a style that suits you. Once you’ve done that, start a regular yoga practice at home if you’re not ready or don’t want to join a studio. WANT TO LOSE WEIGHT SAFELY & EFFECTIVELY? The Namaste Nourished 21-Day Weight Loss Transformation eBook provides you with the tools and knowledge you need to lose weight in a healthy, realistic and sustainable way. In addition to the delicious recipes and 21-day meal plan, you will also learn tactics to beat sugar addiction, improve your gut health, make healthy choices while dining out and more. You’ll learn how to completely transform your health (and waistline) from the inside out. Learn more about the Namaste Nourished eBook here.